Developed in the 1970s, Kariwara is a Towed Array using Hydrophone Technology and is a major defence system developed by Australian scientists. The idea of towed arrays was first suggested by Henry d’Assumpcao, a former Chief Defence Scientist, in 1961. Kariwara is a slim-line buoyant fibre towable and reelable acoustic array streamer developed for use in passive maritime surveillance systems and as a receiver for low-frequency signals in an active system. The hydrophones (or ears) in the array can detect, classify and obtain bearings on sounds of other vessels at long range. The system can also be fitted to smaller conventional submarines and ships, and winched in and stored on vessels. 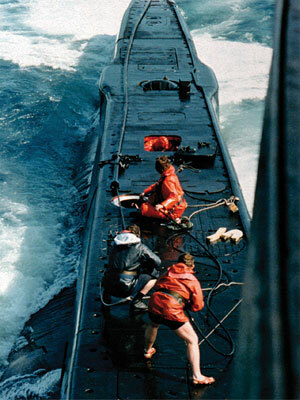 Towed array research and development began in Australia in 1968, when the Royal Australian Navy Research Laboratory (RANRL) purchased an array named ‘Towflex’ from the Chesapeake Instrument Company. Towflex was trialed, and by 1970, significant problems had become evident in the array and handling systems. A joint Australian-US project followed, named ‘Boolee’. Boolee was a five-year study between what was then DSTO (now DST Group) and the US Defense Advanced Research Projects Agency (DARPA), and focused on long towed arrays for the long range detection of acoustically quiet targets. The Boolee trials resulted in the decision to focus on research and development of thin-line submarine towed arrays. DSTO initiated a feasibility study into developing such an array. The slim-line buoyant fibre towed array that was designed became known as Kariwara. Mainly of woven construction, the Kariwara array had a diameter of approximately 30mm and contained hydrophones and electronics embedded in a polypropylene rope core strengthened with Kevlar. Gel was used as the infill to avoid the leakage problems that had arisen in the previous oil-filled arrays. The resultant technology was radically different and provided many advantages over a liquid-filled array with its modular and compact construction, robustness, slim line, environmental friendliness and enhanced acoustic performance. In 1986, the RAN nominated the Kariwara array as Australian Government Furnished Equipment for the Collins-class submarines. The first three arrays were delivered by industry in 1997. The Kariwara slim-line array technology has since been the basis for further developments by local industry, including applications in seismic survey work leading to a very successful export program. The transfer of technology to industry and the collaborative research between DSTO and industry has ensured that Australia retains its international competitiveness in the area of sonar technology. For work associated with the development and use of towed arrays.